Kingston, Jamaica – St. Kitts and Nevis’ Minister of Foreign Affairs, the Honourable Mark Brantley, is currently in Jamaica attending the Caribbean Regional Conference on the Sustainable Development Goals (SDGs) which is being hosted by the Government of Jamaica in partnership with the University of the West Indies (UWI) and the United Nations Development Programme (UNDP). The 17 SDGs, commonly known around the globe as Agenda 2030, will form the main agenda items at the June 28-30 meeting, where Minister Brantley will be joined by more than 200 delegates, including high-level Ministers and technical experts from across the Caribbean, who will seek to accelerate regional action in areas of resource mobilization, reducing inequalities, combating poverty and protecting the planet. Prime Minister of Jamaica, the Most Honourable Andrew Holness, Minister of Foreign Affairs and Foreign Trade of Jamaica, the Hon. 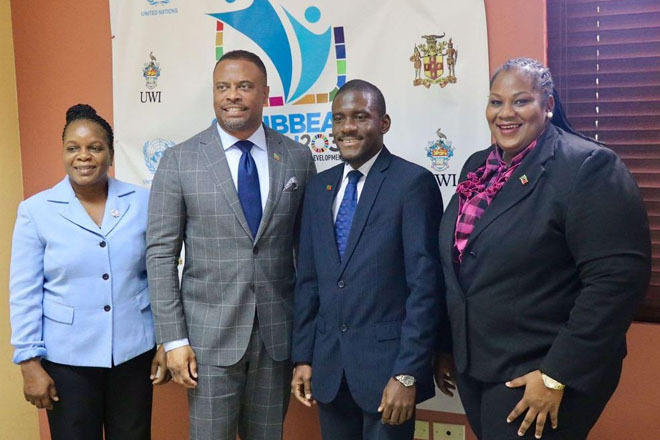 Kamina Johnson-Smith, and UNDP Regional Director for Latin America and the Caribbean, Ms. Jessica Faieta, were among delegates who addressed the opening ceremony on June 28. At the conference, Minister Brantley is also slated to co-chair an important session on “Capacity Building for Public Policy and Rule of Law Institutions” which will seek to guide public policy development for improving access to justice and strengthening mechanisms for governance. Foreign Minister Brantley is accompanied by Permanent Secretary in the Ministry of Foreign Affairs, Ms. Kaye Bass, Second Secretary at the Permanent Mission of St. Kitts and Nevis to the United Nations, Ms. Asha DeSuza, and Director of Sustainable Development in the Nevis Island Administration, Mr. Anselm Caines.